One of the most popular salsas in the world is undoubtedly the tomato salsa, that seems to be heritage of other cuisines and not of the Mexican. When in reality the tomato came to Europe from hand of the Spaniards, that discovered it when they arrived to Mexico and they named it “tomate" – from the Nahuatl tomatl . Although the European cuisines adopted it almost as their own and they elaborated their own tomato salsas. In Mexico we count with various versions of salsas, where the tomato is used as main ingredient. All of them are very singular due to the combination of chilies, herbs and other ingredients that are used in its preparation. The fried tomato and chili salsa has a spicy point, a very Mexican aroma and a soft texture since it is fried. It is a light salsa that will serve you to accompany appetizers , rices , tacos or some dish that has little flavor. This recipe is interesting because the tomatoes’ skin will be taken off, then many activities will be performed and your salsa will be a success. We give the recipe with serrano pepper but you could also use 1 jalapeno pepper. In the original preparation lard is used but it could also be substituted for olive oil. The result will be lighter and subtle. About 25 minutes are needed to prepare the recipe. With this recipe 1 qt of salsa will be obtained. Make a shallow X cut on the inferior part of 5 tomatoes, then reserve. Pour in a saucepan the enough water to cover the 5 tomatoes with the ones you worked and bring it to a boil over high heat. When it boils incorporate in the saucepan the 5 tomatoes with the ones you worked and leave them cooking in the boiling water for about 25 seconds, until the skins start to separate. It is very important to remove the tomatoes’ skin so the salsa will have a better texture. Also add in the blender 2 serrano peppers and blend very well the ingredients; then set aside. Finely chop 1 onion and 1 garlic clove; then reserve. Melt in the saucepan over low heat 1/2 cup of lard. Mix the saucepan ingredients and cook the tomato and chili fried salsa for about 15 minutes, until it thickens a little and acquires a more vivid red color; stir occasionally. When the cooking is done remove the epazote sprig. 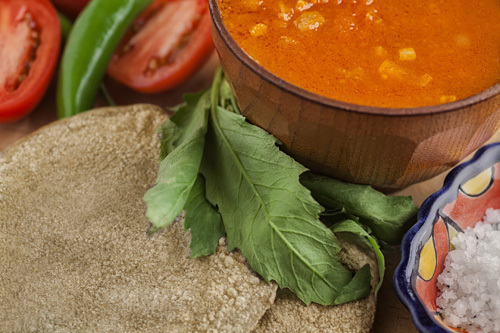 Variation: The tomato salsa can also be found in the version of Mexican style tomato salsa. Did you like the Fried Salsa? If you want to prepare the salsa with jalapeno peppers these are fresh, spicy and they have very good flavor. If you want ot feel a very Mexican spirit in the preparation, use a clay saucepan. A very curious Mexican decoration.